From quite some time nowadays routers offer two large segments of frequency bands to connect to WiFi, and they are 2.4 GHz and the 5 GHz. Each one has its advantages and disadvantages, and we will see which is the most convenient to use depending on your situation, speed, distance, and device. 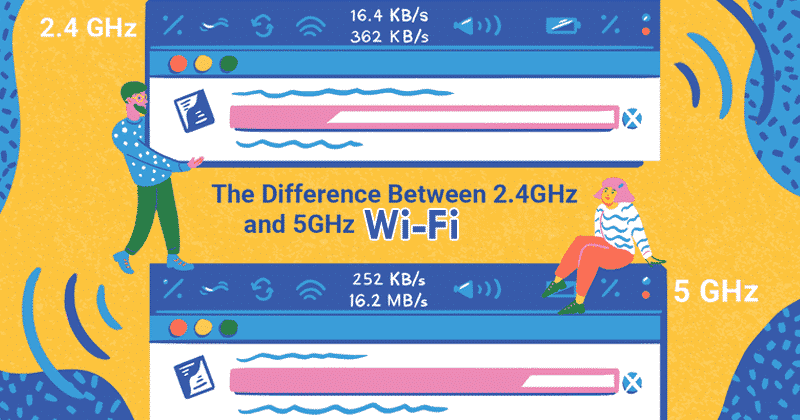 During the first decade of WiFi, it has operated almost exclusively in the 2.4 GHz band. This has made the band very saturated, in addition to the fact that each channel has only 22 MHz of bandwidth, overlapping also with those that are closer. This is the reason why using channels 1, 6 and 11 for WiFi is the best, even though there are less saturated channels such as 14. In 2009, the 5 GHz WiFi began to be used with the 802.11n standard, which we now know as WiFi 4. This new band, when operating at a higher frequency, has a shorter range, but also allows Wi-Fi to operate at a higher speed. In the future, the WiGig will operate at 60 GHz to offer even more speed. This band, in addition, has been thought better than the 2.4 GHz, and each channel is separated so as not to generate interferences between them. However, we must add that there are fewer routers operating in these bands, and they have less range, as well as the interferences in very densely populated areas are greatly reduced. In the case of 2.4 GHz, there are many communications that operate there and generate even more interference, such as cordless phones, Bluetooth, wireless PC peripherals, console controllers, microwaves, and much more. With this, we have the 2.4 GHz WiFi from the 2.412 MHz bands (channel 1) to the 2.472 MHz (channel 13), where there is a new channel in every 5 Mhz. Each channel covers up to 22 MHz, where they overlap each other, hence, in the case of the 5 GHz WiFi, there are 21 channels of 20 Mhz each, where in that space none overlap each other. It is important that you do not confuse between the technologies, since in many routers in the place of 5 GHz network, “5G” appears at the end, which actually doesn’t have any relation or represents the mobile connectivity, as it is another name of 5 GHz network of our router. Another option is to create a network of WiFi in mesh in the home, thanks to which we can have a greater reach in our house, besides being able to enjoy Internet of 5 GHz in more areas without any problems of coverage. Hence, the 2.4 GHz WiFi has more interference due to having channels that overlap each other, but in spite of that, it has a greater range because it operates on a longer frequency. In return, it has a lower connection speed as compare to the 5 GHz WiFi. As in the case of 5 GHz, we have channels that do not overlap each other, that offer more speed when operating at shorter frequencies and can use several channels at the same time, but it has a shorter range because its wavelength is shorter and there is hardly any external interference beyond the other WiFi networks that operate on these frequencies. Currently, the WiFi 4 (802.11n) and WiFi 5 (802.11ac) standards operate with 2.4 and 5 GHz respectively. This simply makes the 2.4 GHz compatible with an older standard (802.11n is also compatible with 5 GHz), while the most modern only works in 5 GHz only.